10/14/2008Share this story on Facebook! 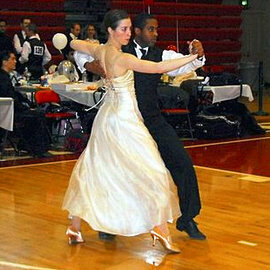 Katie Crutchfield '10 and Roman Issac '10 compete. Watch Katie Crutchfield '10 and Vincent Whitney '11 take first place with their performance in the international cha-cha competition. Later that evening, world mambo champions Carolina and Felipe Telona performed for about 250 spectators. The Telonas are also two-time world salsa champions and Argentine tango champions. They have been featured performers at a variety of prestigious venues during their six years as dance partners. The Cayuga DanceSport Challenge was organized by the Ithaca College Ballroom Dance Club and Cornell University's DanceSport Team. Ithaca College has many student dance groups, whose specialties range from breakdancing to tap dance.